The books here address specifically how the mind learns and how this information can be applied both in academics and in life. Bain, Ken. What the Best College Students Do. Cambridge, MA: The Belnap Press, 2012. Print. Using both quantitative research and interviews with successful students, Bain explores what it takes to accomplish “deep learning.” Includes some fascinating anecdotes along with insights on making the connections to not just get an A, but to really learn. Beers, Kylene and Robert E. Probst. 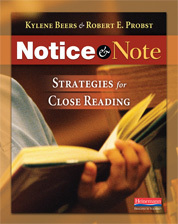 Notice & Note: Strategies for Close Reading. Portsmouth, NH: Henemann, 2013. Using the work of Louise Rosenblatt, the authors put forward strategies for reading texts. After setting forth generalizable language for exploration, they present six “guideposts” to help anchor student learning. Foster, Thomas C. How to Read Literature Like a Professor. New York: Harper, 2008. Print. The strength of this book is that the author uses everyday language and humor to get deep into how authors use language and story. It is a trove of examples of how knowing how words and concepts are manipulated by writers and the effect they have on the reader. Used in many high schools and universities. Geary, James. I Is an Other. New York: HarperCollins, 2011. Print. A comprehensive book on metaphor, especially useful for understanding the Illustrate of SEEI. The author helps the reader to find metaphors, understand them, and then construct our own to help in understanding the world. Aristotle’s observation says it all: metaphors give names to nameless things (150). Newkirk, Thomas. 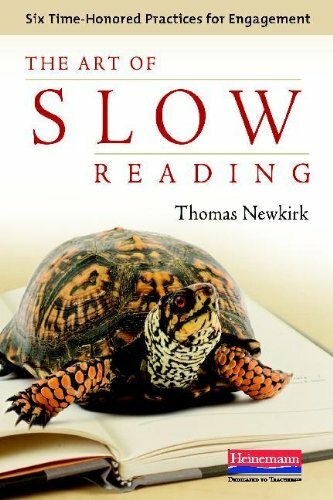 The Art of Slow Reading. Portsmouth, NH: Heinamann, 2012. And advocate to taking one’s time to read carefully, Newkirk presents his case for the power of paced understanding, of being attentive to the words and ideas of a text. Included are practical teaching strategies used in the classroom. Tough, Paul. How Children Succeed: Grit, Curiosity, and the Hidden Power of Character. Boston: Houghton Mifflin Harcourt, 2012. Print. Tough’s book asserts that early nurturing of a child helps it later in life to deal with stress, conscientiousness is the principle predictor of workplace success, and that GPA is a better predictor of college success than the SAT, because the GPA measure motivation and perseverance, what people need most in life to succeed. Motivation and Perseverance are better predictors of success than IQ. Senge, Peter M. The Fifth Discipline: The Art & Practice of the Learning Organization. New York: Doubleday, 2006. Print. Senge’s book explores the importance of understanding how systems work in organizations (business, education, etc.) and how it is critical to move from adaptive learning (reacting to concerns) and move towards generative learning (looking for the creative solutions to the causes of the concerns). It is the seminal work on how systems work and how an organization must be a learning organization, with each person a learner and having input to the group.